Hugger and me in front of the Army Corps’ Larc, which is outfitted with radar, GPS, sonars, and other equipment. 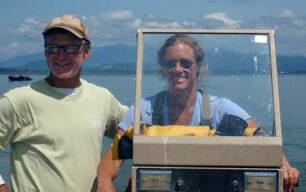 The Larc is used often to deploy instruments, and to survey sand levels along the coast. 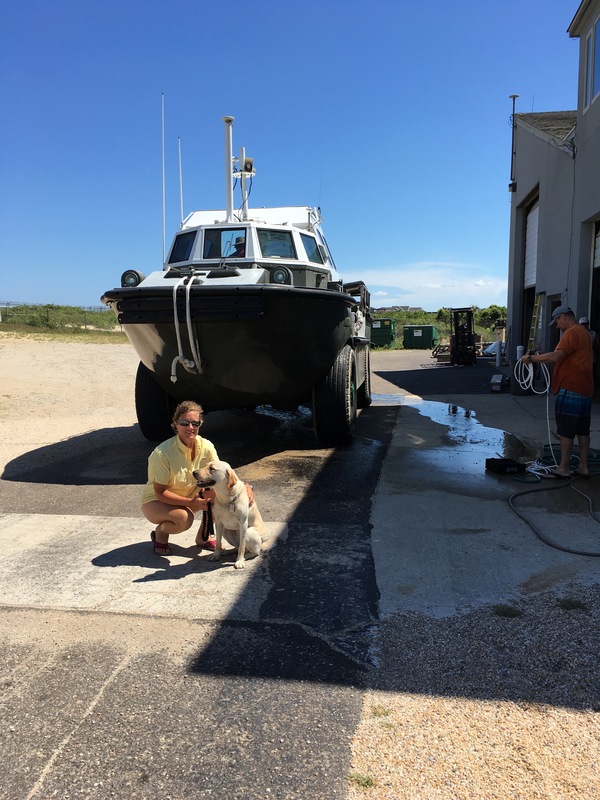 We walk past the Larc high-bay and washing area to get from our equipment van to our office and the dive locker – Hugger makes sure I don’t get in the way, or under the wheels! There are many things that Hugger does that help me do my job. She may not (yet) be able to write computer code, deploy instruments in the ocean, or give a science presentation, but I’d struggle to get to the office, or to the field site, or to the meeting without her. For example, Hugger has been guiding me around the Army Corps Field Research Facility, avoiding all the equipment and vehicles that get moved around. Without Hugger, I’d be a hazard that others would need to watch out for. We can walk from our house to the field site along the Duck, NC boardwalk, which zigs and zags thru the marshes and along the shops. There are joggers and walkers and shoppers everywhere. Without Hugger I would want someone to drive me. 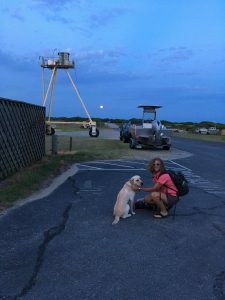 Yesterday, after I finished a phone-meeting with colleagues, Hugger guided me from our office to our beach sampling site to join the crew, which enabled everyone to keep working rather than sending someone to pick me up. A beautiful full moon setting in the west, behind the Army Corps’ boat, used to maintain instruments in the sound, and the Coastal Research Amphibious Buggy (CRAB), which we use often to deploy instruments in the ocean surf zone. The CRAB motor is on the upper platform, which is 25 feet above the ground, enabling it to drive out to 24 feet water depth, and giving us a stable platform even in large breaking waves (where a small boat is unsafe). I doubt I’d be able to hire a human sighted guide and driver for 3 cups of kibble and some hugs and pats each day! And my husband might get jealous, smile. Of course, Hugger does have lifetime health care, and free room and board, which might attract some applicants. I also was asked “why do most of the photos show Hugger without a harness?” Hugger allows me to be independent, so we’re often on our own when she’s working – there’s nobody to take a photo. When we meet up with our field group, she gets to rest, play, and pose for photos! I could change the way I do my work by sending others to the field without me, or not traveling to as many conferences or meetings. But one of the things I love about my career is the variety. And going to the beach! Hugger makes both possible. Britt driving a small boat, with electrical engineer Bill Boyd (SIO) giving instructions (5 deg right, oops now a little left, ….). Britt Raubenheimer is a senior scientist at WHOI, studying the processes along our coasts, including the effects of storms on water levels, flooding, and erosion, and the effects of waves, tides, and winds on sediment transport, pollution, and groundwater behavior (see the PVLAB website). She lost her vision suddenly in 2003 owing to optic nerve atrophy, and trained with her first Seeing Eye™ dog in May 2005. As an employer, WHOI actively considers how we can assist employees with disabilities to be successful! In this situation, WHOI has provided Britt [and others in a like situation] with salary support to enable her to take time to train with her guides.